February 19, 2015 – NASA’S Mars Atmosphere and Volatile Evolution has completed the first of five deep-dip maneuvers designed to gather measurements closer to the lower end of the Martian upper atmosphere. The first deep dip campaign ran from February 10 to 18. The first three days of this campaign were used to lower the periapsis. Each of the five campaigns lasts for five days allowing the spacecraft to observe for roughly 20 orbits. Since the planet rotates under the spacecraft, the 20 orbits allow sampling of different longitudes spaced around the planet, providing close to global coverage. This month’s deep dip maneuvers began when team engineers fired the rocket motors in three separate burns to lower the periapsis. The engineers did not want to do one big burn, to ensure that they didn’t end up too deep in the atmosphere. So, they “walked” the spacecraft down gently in several smaller steps. One of the major goals of the MAVEN mission is to understand how gas from the atmosphere escapes to space, and how this has affected the planet’s climate history through time. In being lost to space, gas is removed from the top of the upper atmosphere. But it is the thicker lower atmosphere that controls the climate. MAVEN is studying the entire region from the top of the upper atmosphere all the way down to the lower atmosphere so that the connections between these regions can be understood. 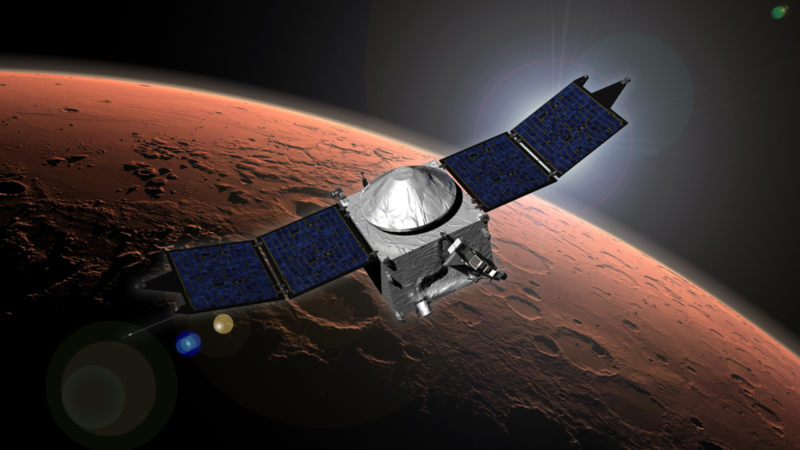 MAVEN is the first mission dedicated to studying the upper atmosphere of Mars. The spacecraft launched on a United Launch Alliance Atlas V on November 18, 2013, from Cape Canaveral Air Force Station in Florida. MAVEN successfully entered Mars’ orbit on September 21, 2014. MAVEN’s principal investigator is based at the University of Colorado’s Laboratory for Atmospheric and Space Physics. The university provided two science instruments and leads science operations, as well as education and public outreach, for the mission. NASA’s Goddard Space Flight Center in Greenbelt, Maryland, manages the MAVEN project and provided two science instruments for the mission. Lockheed Martin built the spacecraft and is responsible for mission operations. The University of California at Berkeley’s Space Sciences Laboratory also provided four science instruments for the mission. NASA’s Jet Propulsion Laboratory in Pasadena, California, provides navigation and Deep Space Network support, as well as the Electra telecommunications relay hardware and operations.